A million children fall ill with TB each year. 239,000 children die every year from TB. TB in children is often missed or overlooked due to non-specific symptoms and difficulties in diagnosis. This has made it difficult until recently to asses the actual magnitude of the childhood TB epidemic. How many children get TB? The World Health Organisation (WHO) estimates are that 1 million children (<15 years) currently suffer from TB worldwide, and that 239,000 die each year. This is the estimate for HIV negative children. Children who have TB and who are also HIV positive when they die (i.e. they have TB/HIV co-infection), are internationally classified as having died from HIV. There is some more information about the number of deaths from TB in children. In 2006 National Treatment Programs were asked by WHO to record and report TB in children, dividing them into two age groups (0 - 4) years and (5 - 14) years. How does a child get TB? A child gets TB in basically the same way as an adult, which is by inhaling TB bacteria which are in the air as a result of being released into the air by someone with active TB. The source of infection for children is usually an adult in their household who has active TB, is coughing and is infectious. There have though also been instances of children being infected in a communal setting such as a school. However in some cases the child’s immune response is not strong enough to stop the multiplication of the bacteria, and TB disease then develops. The risk of progression to TB disease is greatest when the child is less than four years old, and to a lesser extent when they are less than ten years old. There is also a greater risk of progression in children who have a compromised immune system, for example because they are HIV positive. Children who develop TB disease usually do so within two years of first being infected. 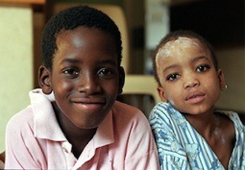 A small number of older children develop TB later, either due to reactivation following a period when the TB bacteria have been dormant, or as a result of reinfection. A child with severe malnutrition. There is a two way link between nutrition & TB. 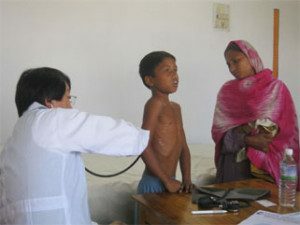 TB makes malnutrition worse and malnutrition makes TB worse. Diagnosing TB in children is difficult as children are less likely to have obvious symptoms of TB, and samples such as sputum are more difficult to collect from young children. Even when sputum can be collected, it may have very few TB bacteria in it (paucibacillary smear-negative disease). What are the symptoms of TB in children? As with adults the symptoms of TB depend on the type of TB that the child has as well as their age.9“Roadmap for Childhood Tuberculosis”, 2013 www.who.int/tb/publications/tb-childhoodroadmap/en/ The most common type of TB disease in children is pulmonary TB but extra pulmonary TB occurs in approximately 20-30% of all cases in children. Disseminated TB such as TB meningitis particularly occurs in young children less than 3 years old. Miliary TB is another name for disseminated TB. In children with pulmonary TB the commonest chronic symptoms are a chronic cough that has been present for more than 21 days, a fever, and weight loss or failure to thrive. Sometimes it is necessarily to use the test results from the adult who is believed to have passed TB on to the child, to ensure that the child is properly diagnosed and treated. How do you treat TB in children? In the same way as TB treatment is provided for adults, TB treatment for children involves a child taking a number of different drugs at the same time for several months. How do you prevent TB in children? The main way that TB is prevented in children is by the use of the BCG vaccine. Access to care must be provided at the community level. Screening households where an adult is diagnosed with TB to see if children have been exposed in the home must become the standard implemented everywhere. Where this approach has been piloted, 72 percent of at-risk children have been able to receive preventative treatment, up from less than five per cent previously.